My sister and I took our Mother to Vienna for a birthday treat five years ago. It was her 60th and we wanted to celebrate in style with her. It was early December when we went and it was ridiculously cold. My sister and I weren’t expecting it to be quite so cold so we weren’t as well prepared, clothes-wise, as our Mother was. I remember us going back to the hotel one afternoon so my sister could defrost. She was chilled to the bone. Her feet were like lumps of ice and it took ages for her to get feeling back. So we bought some fur-lined insoles for her so her boots were a bit more insulated! There was snow everywhere and the sky was full of foreboding dark grey snow clouds so the place didn’t have much colour to it. It did mean, however, that flashes of colour really stood out. I remember seeing a driver of a horse and carriage dressed as Father Christmas and his horses had Father Christmas hats on – a bright red splash of colour on the otherwise white-grey surroundings. Whilst we were in Vienna we went to see the infamous Spanish Riding School dancing horses at the Imperial Palace. It was incredible. The relationship between the horses and their riders was amazing and the choreography and timing was so impressive. To get horses to ‘dance’ in unison like that is such an art. I would encourage anyone to go and see them. You won’t be disappointed. Before we arrived, we had told the hotel we were staying in that it was our Mother’s birthday and when we checked in and were taken to our fantastic suite (yes, it was a proper suite!! ), we were greeted with a lovely surprise. The hotel had left a small Sachertorte in a tin as a birthday cake and as a memento to take home and enjoy. 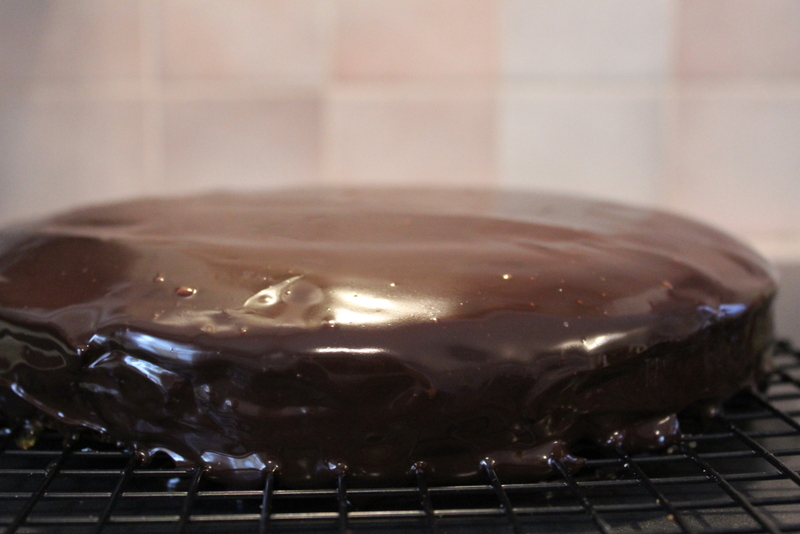 It was my Mother’s 65th birthday a few weeks ago, and I decided that I would try to make my own Sachertorte to give her as a birthday cake. She absolutely loved it!! I don’t think this is a traditional sachertorte recipe, although the original recipe is a closely guarded secret so who knows. 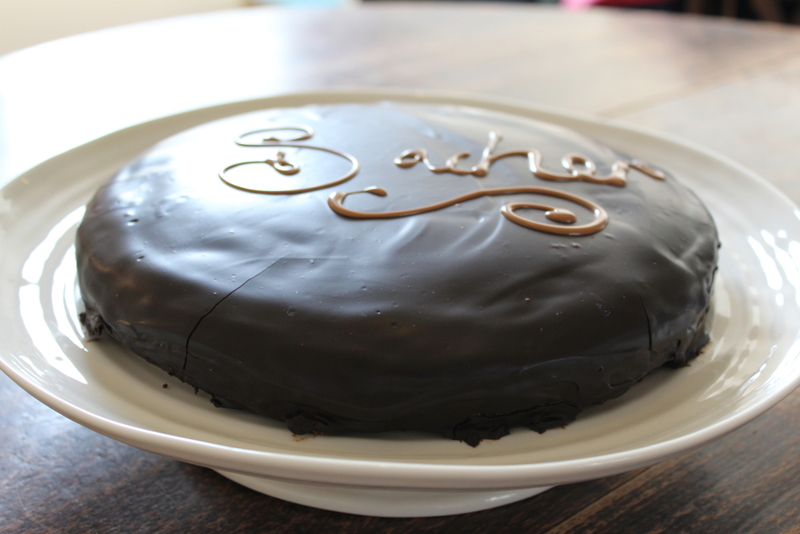 Hotel Sacher, which guards the recipe, is allowed to call its cake the ‘Original Sacher Torte’. The cake has caused a lot of controversy in Vienna. It’s a bit of a long story, so bear with me….. In 1832, Prince Wenzel von Metternich asked his head chef to make a posh pud for some of his guests. His chef fell ill, so it was left to his 16 year old apprentice to come up with something. His name was Franz Sacher. The cake was a success, but didn’t really get much more press and Franz completed his training and then ended up opening a delicatessen and wine shop. Franz’s eldest son (Eduard) also became a chef and trained at the Demel bakery where he perfected his Dad’s recipe. The cake was actually first served at the Demel and then later at Hotel Sacher, which was established by Eduard in 1876. After Eduard and his wife had both died, the Hotel Sacher was declared bankrupt in 1934. Eduard’s son (also confusingly called Eduard) got a job at Demel and took with him the sole distribution rights for an Eduard-Sacher-Torte. The first disagreements started a few years later, when the new owners of Hotel Sacher started to sell sachertortes under the trademarked name ‘The Original Sacher Torte’ and that’s when the legal battle started. Are you still with me? The legal battle was over the name, but also arguments over the cake’s characteristics ensued including whether the cake has one layer of jam or two, and even if the recipe used butter or margarine!! I’m not joking! 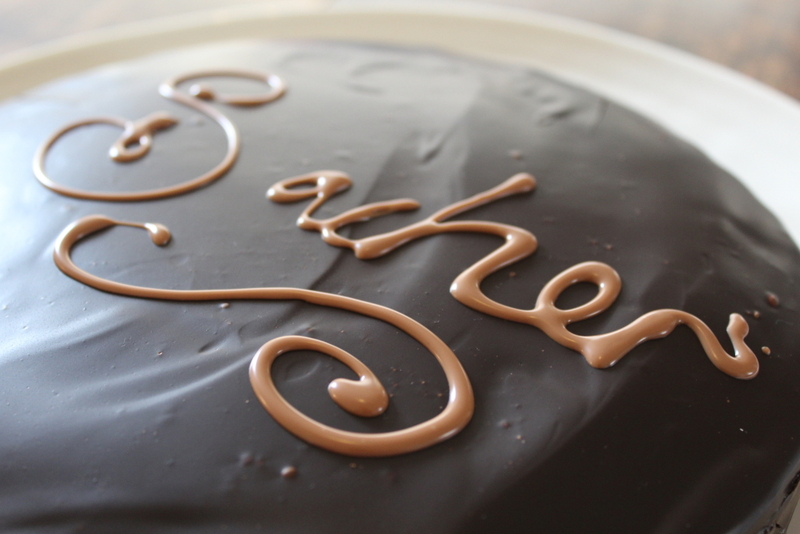 Hotel Sacher won the right to call their recipe the ‘Original Sacher Torte’ and the Demel bakery won the right to decorate its tortes with a triangular seal that reads Eduard-Sacher-Torte. And the rest is history! To me, it seems a bit unfair that the first Sacher torte was sold at the Demel bakery and yet it isn’t allowed to call its cake the original, but I probably don’t know the full story. Preheat the oven to 180C. Grease a deep 23cm/9in round cake tin then line the base with greaseproof paper. Break the chocolate into pieces, melt gently in a bowl set over a pan of hot water, stirring occasionally, then cool slightly. Beat the butter in a bowl until really soft, then gradually beat in the sugar until the mixture is light and fluffy. Add the cooled chocolate and the vanilla extract and beat again. Add the egg yolks, then fold in the ground almonds and sieved flour. The mixture will be quite thick at this stage. In a separate bowl, whisk the egg whites until they are stiff but not dry. Add about one-third to the chocolate mixture and stir in vigorously. Gently fold in the remaining egg whites. Pour the mixture into the prepared tin and level the surface. Bake in the oven for about 45-50 minutes, or until well risen at the top and the cake springs back when lightly pressed with a finger. Leave to cool in the tin for a few minutes then turn out, peel off the paper and finish cooling on a wire rack. Make the icing by breaking the plain chocolate into pieces. Heat the cream until piping hot, remove from the heat and add the chocolate. Stir until the chocolate has melted, then cool till a coating consistency. Then pour the icing on to the centre of the cake. Spread it gently over the top and down the sides, and leave to set. For the ‘icing’ writing, break the milk chocolate into pieces then melt gently in a bowl set over a pan of hot water. Spoon into a small paper icing bag or polythene bag and snip off the corner. Pipe ‘Sacher’ across the top and leave to set. My piping wasn’t amazing, but it’s the first time I’ve done it. If you’re not an expert I recommend practicing a few times first (and make sure your chocolate has cooled down a bit or it will be too runny). 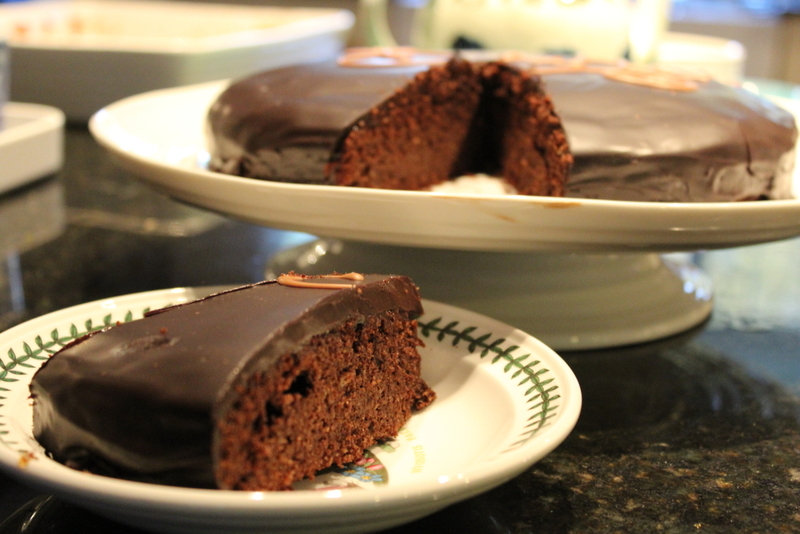 5 December is national Sachertorte day. Imagine having a whole day dedicated to celebrate a cake – fantastic!